Jelly Doughnut Hearts – Gotta Love ’em! 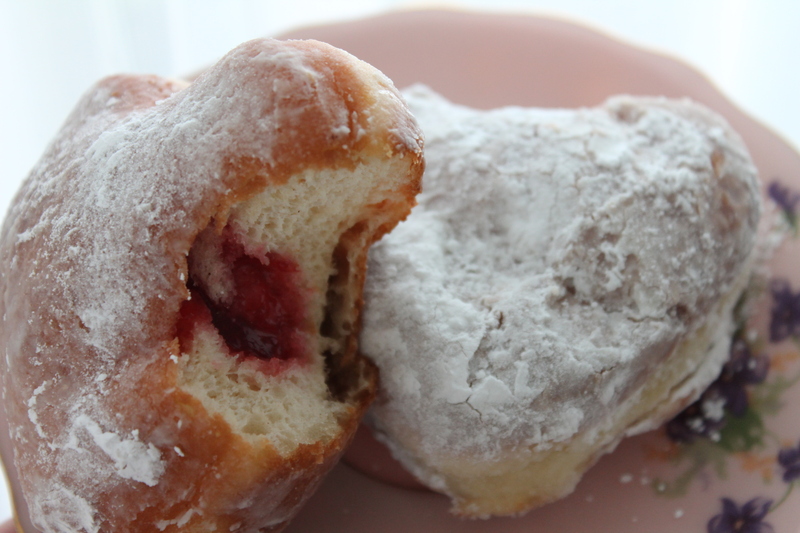 A puffy, sweet pastry covered in sugar and oozing raspberry jelly…what’s better than a jelly doughnut? 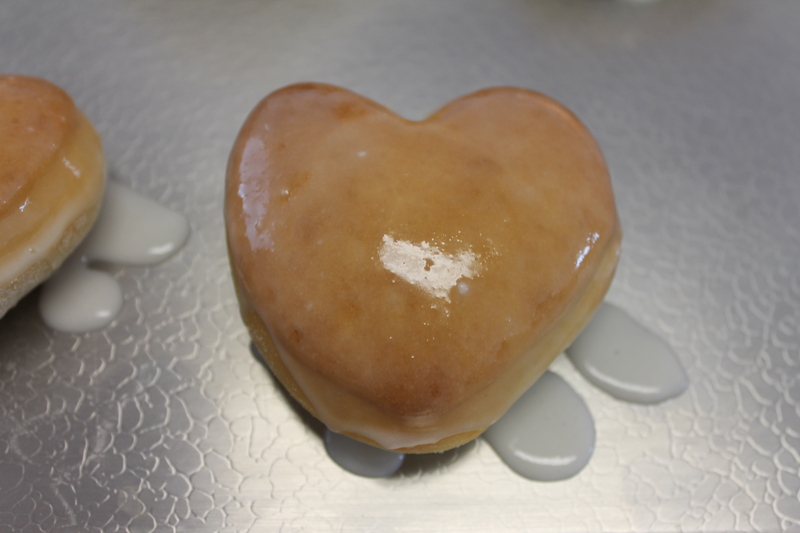 A homemade, heart shaped jelly doughnut! Make a batch of these for Valentine’s Day and score some serious Brownie points! It’s really not as hard as you think, but you have to be willing to deep fry these; if you bake them you’ll lose some of the flavor and a lot of the tender texture. I tried them glazed, rolled in sugar, and dusted with powdered sugar. And when I say I tried them, I mean I tried them. I couldn’t present them to you untested, right? Oh, the sacrifices I make! They were all delicious, but I think the traditional powdered sugar doughnut was my favorite. Put a smile on someone’s face and give this recipe a try! In a small pan on medium-high heat, scald the milk. To do this, let the milk heat until there are bubbles all the way around the outer edge, but catch it before it boils. Remove from heat. Add ⅓ cup plus one tablespoon sugar, shortening, salt, and cinnamon. Allow the mixture to cool down until it’s lukewarm. In a large bowl (I use my stand mixer) combine the warm water, yeast, and 1 teaspoon sugar. Let it sit until bubbly – about 5 minutes. Mix the lukewarm milk mixture into the yeast mixture. Add eggs one at a time, mixing well. Slowly add the flour, mixing until combined. Knead well–5 minutes with stand mixer using the dough hook, or 7-8 minutes by hand on a lightly floured surface. If you're using a mixer, it will look very sticky at first, but at the end of the kneading time it should be a soft, elastic dough. If it is still sticky, add a little more flour and knead for another minute. Set the dough to rise in a large oiled bowl, turning once to coat the dough with oil. Cover and allow to rise until double–about an hour. Punch down. On a lightly floured surface, roll the dough out to about ⅓ inch - definitely no thicker than ½ inch. They will puff up a lot when they're fried! Cut with a heart-shaped cookie cutter, getting the hearts as close to each other as possible. The first rolling is definitely the best; re-rolled dough is tougher. 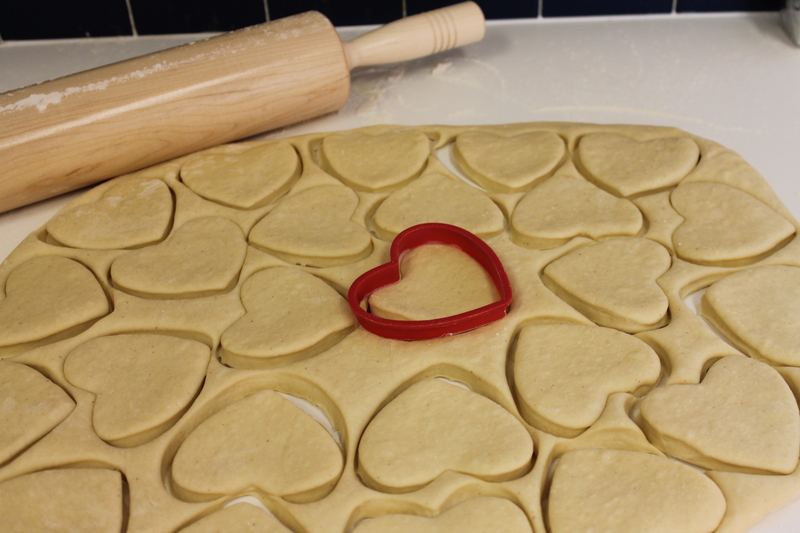 Remove the extra dough around the hearts, cover them with a clean dishtowel, and let them sit for 30 minutes. Heat at least 2 inches of oil in a large pan until it's between 350 and 365 degrees. Drop a few hearts into the hot oil at a time, giving them lots of room to move around. Once the bottom is a dark golden brown, flip the hearts over. If yours are like mine, they’ll have minds of their own and might insist on flipping right back over. Don’t let them win! When both sides are brown, remove and drain on paper towels. Move to a baking rack to cool. When the doughnuts are just barely warm, shake them gently in a bag of powdered sugar, or roll them in granulated sugar. If you prefer glazed doughnuts, mix a little water into powdered sugar (a drop or two of vanilla is nice, too) until you have a thin glaze. Dip the doughnuts or brush the glaze on with a pastry brush. To fill, use a pastry bag with a piping tip. 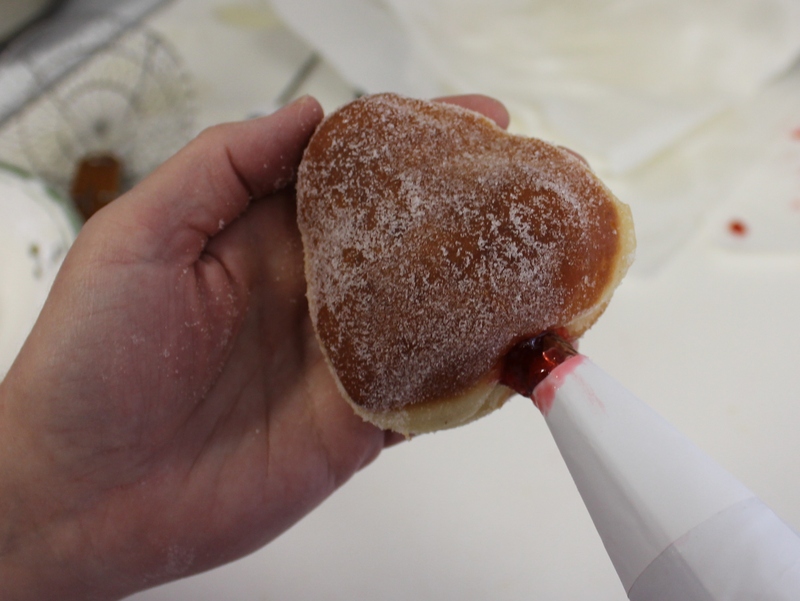 Fill with jelly and poke the tip in the side of the doughnut, squeezing firmly. OR (this worked best for me) use a chopstick to poke a hole in the side and use a zipper bag filled with jelly (cut one tip off) to fill the doughnut. Make sure to wipe the powdered sugar off your chin before your family comes home! I know for a fact that the glazed doughnuts freeze well, but I haven’t tried freezing the sugared doughnuts. So I guess I’ll just have to freeze the eight glazed hearts and eat all the rest. Yep – works for me! This entry was posted in Holidays, Sweet pastries by Lorinda. Bookmark the permalink. 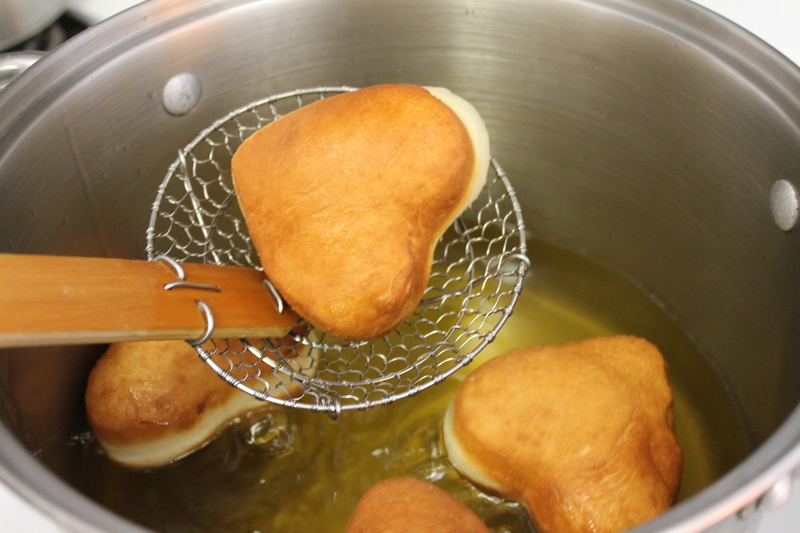 I don’t have a deep fryer but have to try these because I <3 jelly doughnuts, especially raspberry! I wonder how coconut oil would work? Coconut oil would be expensive fine. Just don’t take it over 350 degrees. So…over two years later I see this comment! And you sound like you were in such a hurry for a doughnut…. Thank you for commenting – comments are like gold! They make me deliriously happy too! Well…until I step on the scale…but we won’t think of that right now, okay? DOUGHNUTS for the win!